The exhibition (Un)real Dreams presents artists’ attitudes towards socially committed art. A confrontation of two artistic manifestoes, Mieczysław Szczuka’s Art and Reality and Artur Żmijewski’s Applied Social Arts, provokes questions about art’s role: should it be useful in everyday life? Should it have an influence on mass consciousness and imagination? Should it fulfil itself as a purely aesthetic form? The artists distance themselves from art that isolates itself from social issues. In an attempt to design architecture that meets human needs, Mieczysław Szczuka created a vision of garden houses in garden cities, urban settlements that were to harmonise concrete architecture with nature. 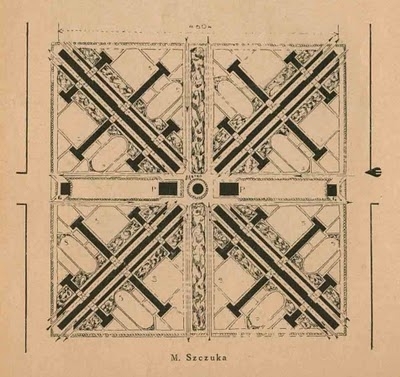 Szczuka believed that introducing greenery and an abundance of natural light to glazed interiors would greatly improve living standards. The idea’s paradox can be felt clearly in the exhibition space, which is located in a housing-estate apartment block rooted in the modernist dream of the ‘machine for living’. Nicolas Grospierre offers a contemporary reflection on modernist architecture in The Glass House. Theoretically a symbol of social transparency and openness, glass architecture became a means of controlling both the resident and the indoor greenery. The idea of a ‘green interior’ is referenced by Patryk Kowalczyk’s light installation, the young artist making a symbolic gesture to realise the dream envisaged by Mieczysław Szczuka. Yael Bartana and Artur Żmijewski’s Demonstration Against War in Gaza, 17 January 2009, Tel Aviv-Yafo, Israel, made for the Haifa Museum of Art’s History of Violence exhibition, was created in response to the Israeli invasion of the Gaza Strip. Criticised for ‘ordinary documentariness’ and lack of artistic values, the project was rejected by the show’s curators. The work reflects the artist’s strategy with its postulate of making socially meaningful art. Żmijewski’s mode of work is highlighted by press materials collected during the making of Democracy, a project meant to fulfil the idea of socially committed art. A similar form of expression is employed by the duo KwieKulik in Manifestations (1972–1982), as part of which the artists, Przemysław Kwiek and Zofia Kulik, video document major ceremonies of the contemporary world: the Olympics, Brezhnev’s funeral, the Pope’s visit to Poland, or the May Day parade. Experimenting with new aesthetics, the duo focused on official political and propagandistic events.